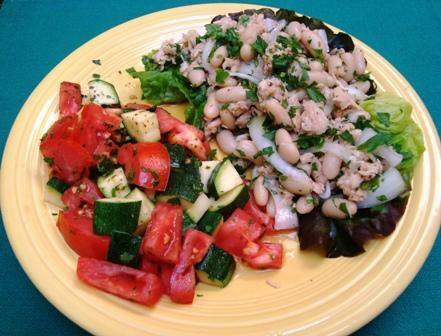 Tuscan Tuna and Bean Salad with Zucchini Tomato Salad– a quick dinner that won’t heat up your kitchen. 04/11/13 - Syndicated food columnist Linda Gassenheimer, Special wine correspondent Fred Tasker and WLRN hosts Joseph Cooper and Bonnie Berman interview interview, Richard Fain, CEO/Board Chair of Royal Caribbean Cruise Lines and chair of Veritage Miami (United Way Food and Wine Festival.) He’s changed the name to Veritage.